Arts Manhattan is no more. But don’t place a wreath on the coffin just yet because the group has, with modifications, metamorphosized into Art Avenue Foundation according to Homeira Goldstein. As past president of the former and now president of the latter, Goldstein knows better than anyone else how the art organization she’s led has been progressing through our changing times. She says that the name Arts Manhattan was somewhat vague. However, the internal drive will not remain exactly as it was before. In the past, the City of Manhattan Beach has allotted Arts Manhattan time and space for two shows a year in the Creative Arts Center located across from Polliwog Park on Manhattan Beach Boulevard. The venue, although not difficult to reach, has always been hampered as a showcase for art by the fact that it was formerly a library. But because of management and/or policy changes Goldstein’s group will only be presenting one show there this year, and just one next year as well. After that, she says, the City told her that there will be two slots available for her each year. What Goldstein realizes, of course, is that Art Avenue needs a kind of storefront presence, which means other venues where her organization can also hold exhibitions and thus keep their name and purpose in the public consciousness. In the past, Arts Manhattan was also adamant about holding dance and music events, as well as insightful conversations with artists. That’s all well and good, but in the meantime Art Avenue is presenting its inaugural show, “Natalie Arnoldi: West of Manhattan,” and Homeira Goldstein has me convinced it’s going to be a good one. Natalie Arnoldi is just 24 years old, but she seems to be ahead of the pack by at least a couple of laps. Although she grew up in an artistic household, Arnoldi’s recent degree from Stanford is in Earth Systems, where she specialized in ocean science and policy, and her bachelor’s is in Marine Biology. Living in Malibu, Arnoldi has had the ocean whispering in her ear for a long time now. 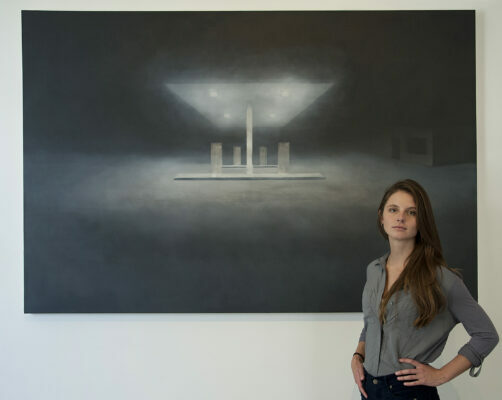 However, with exceptions, her work hasn’t been concerned with seascapes and the typical coastal scenes that local artists seem to cough up in droves. “I am very interested in exploring the line between abstract and figurative work – trying to combine the ambiguous evocativeness of abstract painting with enough figurative representation to place the viewer in a specific time and space. Even though she’s about to become a practicing scientist, where she will be expected to bring clarity to her findings, Arnoldi purposefully obscures the objects in her art. In the end, the viewer must reach his or her own conclusions. In short, Mallarmé and Debussy knew this, Salome knew this, the veiled object is often more alluring than the one in floodlights. 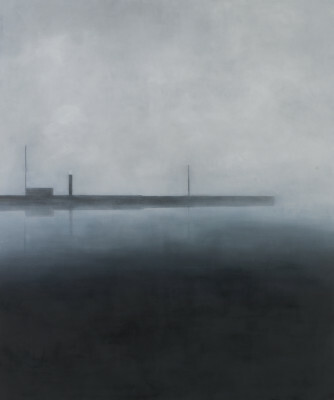 Arnoldi’s work can simultaneously appear tranquil and ominous, foreboding. A road disappearing into heavy fog: Is there a large truck about to emerge on the wrong side of the yellow lines? An airliner vanishing into mist: Is it about to hit something while in mid-flight? Arnoldi’s paintings appear to be strictly in black and white and gray, although there is color if one looks closely. However, in their austerity – for they are never crowded with extraneous detail – these somewhat monochromatic works suggest rather apocalyptic scenarios. One can read alienation or abandonment into them and, again, there is that sense of the foreboding. Arnoldi mentions a Fourth of July fireworks show a few years back that took place when the cloud cover was so low that the fireworks actually disappeared into and exploded within the clouds. She recounts the beautiful, mysterious effects this created, and says that up until then she’d wondered how to incorporate color into her work. Well, fireworks in the fog was an image and an impetus that compelled her to create an entire series based on this rare phenomenon. 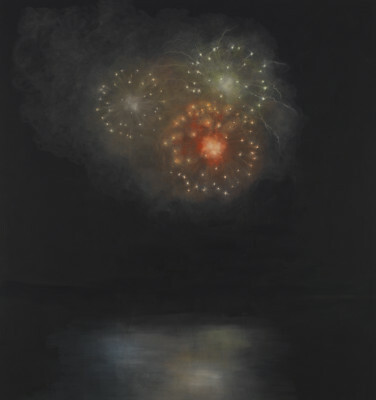 Personally, I find this series doubly interesting because exploding fireworks are both figurative and abstract at the same time, being a recognizable image and yet one that’s ephemeral without any real shape or form. I can’t wait to step into the gallery and see them all together. When: Opening reception Thursday, Sept. 4, from 6 to 8 p.m.; artist talk at 7 p.m. Hours, Tuesday, 2-6 p.m.; Wednesday, 4-8 p.m.; Thursday, 2-6 p.m.; Saturday, 1-5 p.m. Closes October 9.